CPC deputy general director, Nguyen Thanh, told Vietnam News on March 30 that the plant will be located on 70ha in five rural communes of Cam Lam district and Cam Ranh city, 40km south of the city of Nha Trang. He said the company has been awarded an investment certificate by the provincial People’s Committee, and a feasibility study would begin in late 2017. As scheduled, the plant will supply renewable energy for rural areas and the national grid from 2019. Thanh said the corporation and EVN have been negotiating with the Asia Development Bank (ADB) in seeking preferential loans for the project. The Da Nang-based corporation also plans to co-operate with Japanese Mitsubishi in production of battery-powered cars. According to a survey, Khanh Hoa has great potential for solar energy with solar radiation of 5.4Kwh per square metre each day, and over 2,600 sunshine hours a year. The province said 10 investors have registered to develop solar power projects in Khanh Hoa, with a total capacity of 2,000MW. 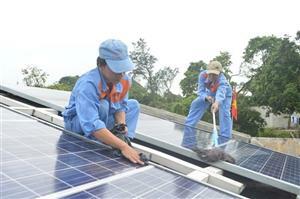 In 2014, Vietnam’s first solar power project with a 19.2MW-capacity was built in the central province of Quang Ngai.